Um, where did spring go? I’ve gone from a week of bike rides, beach cleans and ice creams to indoor picnics and damp trips to the park. Come back! Fortunately, I’m all about the little things and there’s plenty to smile about, even when the sky is grey. Here are a few favourites from last week. 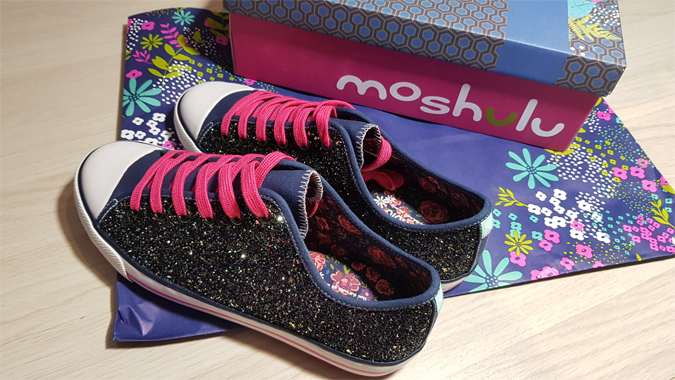 Yep, I know I just got a new pair but I had to go back for the glitter ones. Because I’m not exactly an ‘out-out’ kinda gal these days, I was going to save these for my ‘special’ (aka nice dinner) shoes but why barely use them? These deserve to be every day shoes, ammiright? If you fancy ordering a pair, you can find them here. The new Strongbow ad came on the other day. I don’t often watch live TV so I rarely see adverts these days and this was a nice surprise. It’s quite long for a TV ad and I love that they let quite a lot of the song play out. I can’t help thinking it’s one of my favourite songs because it’s on a film soundtrack (as most of my favourite songs are) but I can’t for the life of me remember which one. Any ideas? 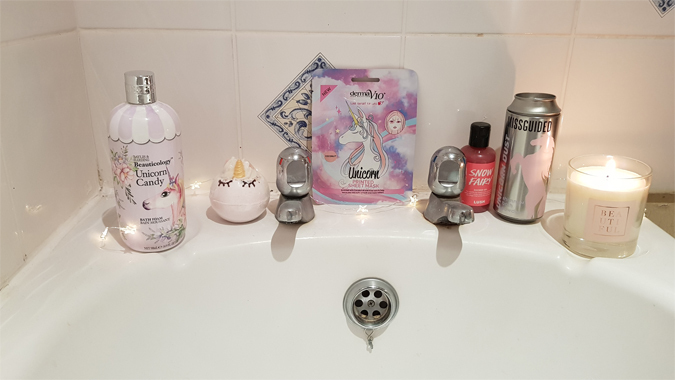 My ultimate indulgence is a bath and a podcast and I finally had my first pamper night of the year last week. I’m never gonna have a bath like Paige so this is as good as it gets for me at the moment. Next time we move, I’ll certainly be putting an epic bathroom on my list of priorities. I finally listened to Vix’s podcast and loved the episode on imposter syndrome. I’m going to try and catch up on more episodes soon. I opened up Netflix the other day and Unicorn Store popped up on my home screen. Immediately intrigued by the name and the star (Brie Larson, who also directed the film), I let the trailer play out and knew I had to make time for it over the weekend. In fact, I watched it that night after deciding my headache was a sign I needed a self-care night. I’m forever adding films to my list and not going back to them as I tell myself I don’t have the time or will fall asleep. Before Jenson came along, Luke and I would spend the odd Sunday watching films and cooking together. We’d each choose a film and then watch one we both wanted to see. It was a great way of getting out of our comfort zones and I liked choosing quirky indie films, something I studied during my final year at uni. Unicorn Store is tagged with ‘quirky’ and ‘heartfelt’, something my viewing has been lacking lately, in a sea of kids’ shows and Neighbours. Give it a watch. It’s a really lovely film about a young woman who moves back home and doesn’t really know what to do with herself. Then she’s offered the chance of fulfilling her life-long dream of adopting a unicorn. I know how it sounds but trust me. Warm and fuzzies guaranteed. 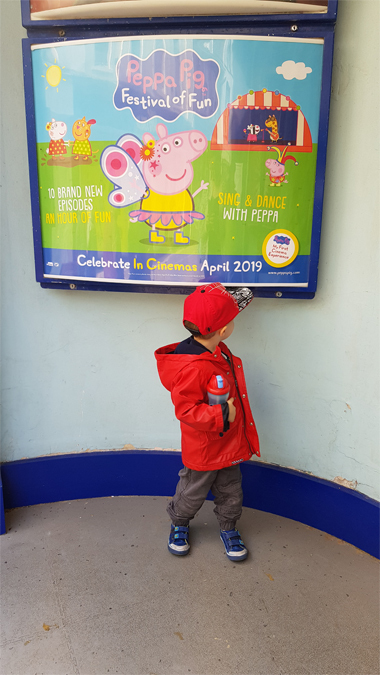 I first took Jenson to the cinema two years ago, the last time Peppa Pig did a cinema experience. He barely sat still for two minutes and I decided to leave it a while before taking him back again. When I saw listings for a new Peppa Pig screening I thought I’d give it a go. It’s only an hour long and I figured he could handle that. Which he probably could have, if it wasn’t preceded by 25 minutes of adverts and trailers. Why do this for kids’ films?! Regardless, it’s a fun hour for little ones, with plenty of opportunities to get up and move about, something Jenson was a lot more into this time. Plus it didn’t have the annoying woman from last time. He loved it and I’ll be taking him back next month as there’s a Paw Patrol special. Hopefully we can time it around his birthday for an extra special treat. He was quite taken by some of the trailers too. A feature film might be a bit of a stretch for him but I’m semi-confident he can sit through Frozen 2 and The Secret Life of Pets 2. Toy Story 4 might he a bit much as he’s only really familiar with Mr Potato Head. I’m going to try and get him to watch them at home first, not least because I want to see it! This week sees the start of the Easter holidays but it’s business as usual for us. Jenson goes to nursery all year round so I haven’t booked any annual leave. This time next year it’ll be a different story – next week we find out what school he’ll be going to. I know I say it all the time but I really don’t know where the time has gone. Ahh I love the look of the bath products! I’ve actually been wanting to try the MissGuided bath stuff out forever.